The study of anesthesiology and the administering of anesthesia have been a part of the life of Weill Cornell Medical College since its inception. Founded in 1898 as Cornell University Medical College, the institution joined with New York Hospital (founded in 1771) under an affiliation agreement in 1913. As both the College and Hospital have grown and expanded over the last century, the study and practice of anesthesiology have similarly transformed and modernized. A Division of Anesthesiology was created in 1947, and steadily grew during the decades that followed, becoming a full Department in 1967. Today, Weill Cornell Medical College and the NewYork-Presbyterian Weill Cornell Medical Center are home to leading-edge research into anesthesiology, as well as a high-quality anesthesiology clinical practice that puts the care and well-being of patients first. Historians of medicine locate the beginnings of modern anesthesia in the 1840s. In 1846, a Massachusetts dentist, Dr. William T.G. Morton, used inhaled ether to anesthetize his patients. Although a Georgia physician, Dr. Crawford Long, had been using ether as an anesthetic for several years, it was Morton’s publication of his procedures and results led to other physicians to adopt the practice on a widespread basis, including at the New York Hospital. Dr. Thomas Bennett was hired as the Hospital’s full-time anesthesiologist in 1898. By 1902, the Hospital’s Private Patient Service had its own anesthesiologist, and both doctors and nurses were regularly administering anesthetics. In 1932, a separate Anesthesia Service was created, organized under the Department of Surgery, and led by Dr. Ella Hediger. The need for anesthesiologists and their expertise increased during the 1930s and 1940s, and the Medical Board proposed the creation of a separate Division of Anesthesiology in 1943. It finally came into being in 1947. Dr. Joseph Artusio was the anesthesiologist chosen to lead the new Division of Anesthesiology. Dr. Artusio would go on to serve as chair for over forty years (1947-1989), first of the Division, and then of the Department of Anesthesiology (1967). In addition to administrative leadership, Dr. Artusio was a dynamic researcher. He developed anesthetic methods for early surgery on the heart, and also developed edrophonium, one of the first muscle relaxant reversal agents. In 1954, Dr. Frank Glenn and Dr. Artusio developed ether analgesia, an anesthetic technology that allows a patient to remain conscious, but not feel pain, nor retain memory of the surgery. 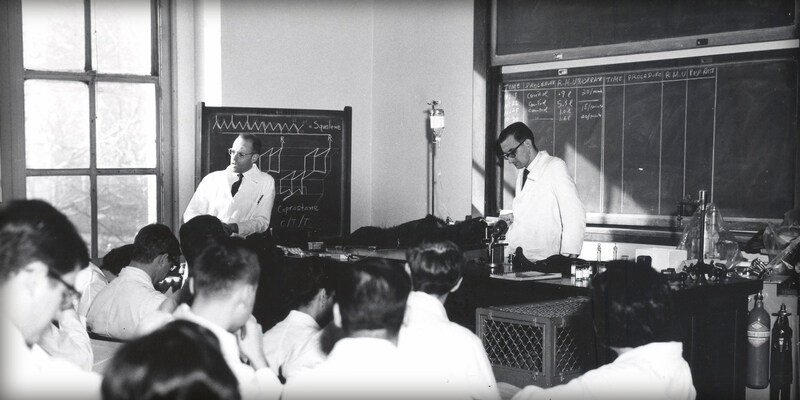 Between 1958 and 1961, Dr. Alan Van Poznak and Dr. Artusio developed methoxyflurane, a non-flammable ether inhalation anesthetic. Following Dr. Artusio’s retirement, Dr. John J. Savarese became Chair of the Department of Anesthesiology, providing leadership through the next 24 years (1989-2013). Dr. Savarese is one of the world's experts in the field of muscle relaxants and has continued Dr. Artusio’s pioneering work in that field. Administratively, Dr. Savarese altered the clinical direction of the department by developing the subspecialties of anesthesia, promoting anesthesia involvement in critical care, enlarging the residency program, and increasing the number of nonphysician providers in the department. The department grew from 35 to 75 attending anesthesiologists, and from 28 to 60 residents and interns. In terms of physical space, the Department doubled, from 17 to 35 operating rooms. Numerous investigators, both MDs and PhDs, pursuing both basic science and clinical research, joined Anesthesiology under Dr. Savarese’s term as Chair. In 2013, Dr. Savarese was succeeded as Chair by one of the Department’s leading researchers, Dr. Hugh H.C. Hemmings, Jr. Under Dr. Hemmings’ leadership, the Department of Anesthesiology works to continue its position as a leader in anesthesiology research and clinical practice. * - Photos used courtesy of Medical Center Archives of NewYork-Presbyterian/Weill Cornell. Please visit the Archives.